← Are you saying Hawaiians like to eat? 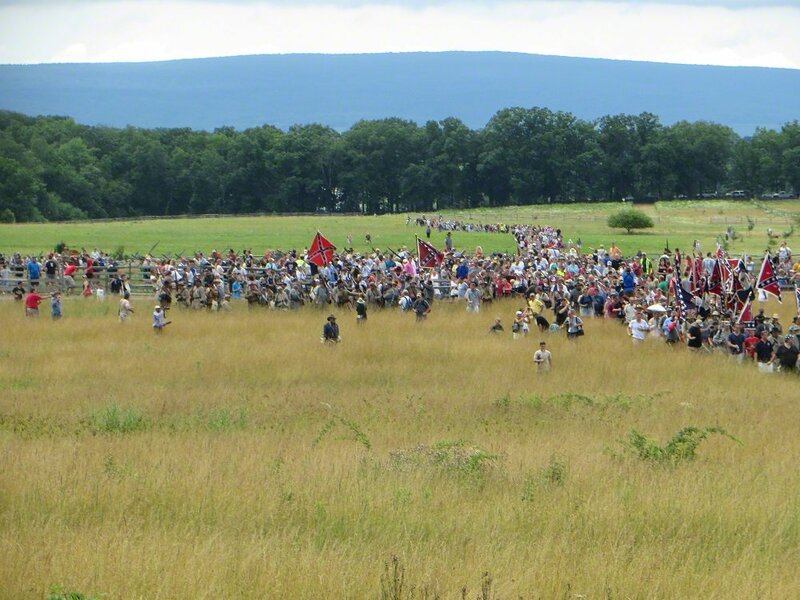 I had gone to Gettysburg for the 150th anniversary commemorative march of Pickett’s Charge intending to join the Confederates. No reason except wanting the experience of walking across the field with thousands of others. I’d even chosen a brigade – Richard B. Garnett’s — because one company of its 8th Virginia Infantry had been raised in Fairfax, Virginia, where I had spent the majority of my life. When I got there, though, something – the heat? the ideology? the thought that I could get better pictures of the march facing them than walking with them? – made me change my mind. I joined John Gibbon’s division and took my place at the front of the Union line, directly across from the Virginia monument. It was noon and we had three hours until the charge. Waiting on the Union line was like being at a battlefield tailgate. A row of folding lawn chairs filled with raucous people spread out on either side of me. Did I mention that she was holding a bucket of Kentucky Fried Chicken? I actually felt sorry for the daughter. 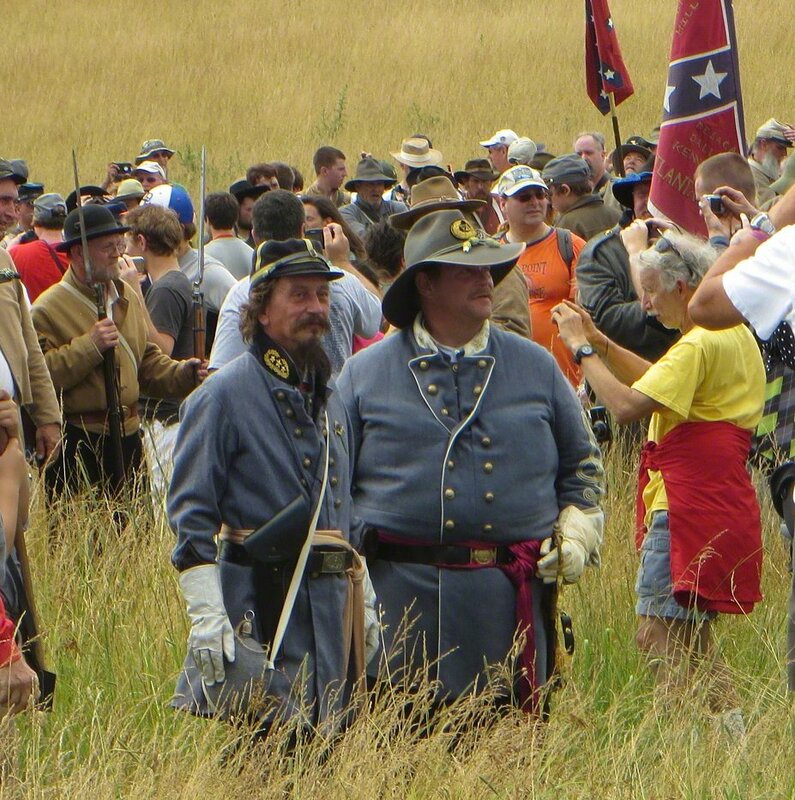 A reenactor portraying General Hancock walked up and down the line, rallying the troops. “Do you have any advice for us, General?” someone asked. Longstreet opened fire at 1:00 and sure enough, at 1:00, came the boom of cannons. It wasn’t constant, but it was ongoing. A college history professor in the crowd pointed out that this modern recreation was an hour off. “No day-light savings time back then,” he said. Across the field, we could see the Confederates spread along the tree line of Seminary Ridge. And we could hear them chanting, though we couldn’t make out the words. There was an occasional rebel yell. At 3:00, the Confederates began to move — first the center, then the left, and finally the right. They even seemed to be executing maneuvers, stopping and starting along the way. The effect of the rolling mass of humanity headed toward us was mitigated slightly when they had to move into a column to get through an opening at Emmitsburg Road. No climbing fences, it seems. 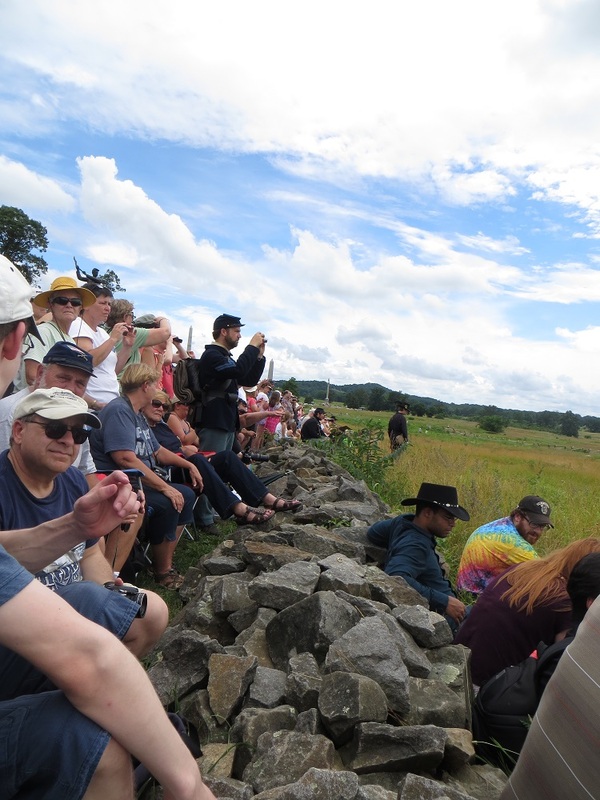 The tourists were led by National Park Service rangers and reenactors in uniform. “Here comes Armistead’s brigade,” said a boy behind me. I was ready to be impressed – he must have recognized the brigade flag – when he continued, “His name is on the flag in front.” Sure enough, blue flags bore the name of each brigade commander. In this recreation, Robert E. Lee led the troops and once he got to the Union line, he shook hands with General Mead at the High Water Mark. Media closed in around them and hundreds of cameras flashed. Pickett posed. It was the Confederacy’s red carpet moment. As the last of the Confederate troops crossed Emmitburg Pike, buglers posted along the stone wall began to play Taps-in-the-round. It started at the far right and each successive musician created an echo that worked its way down the field to the last, solitary, haunting note. Then the Confederates began climbing over the wall, to get to friends and family. We didn’t try to stop them. 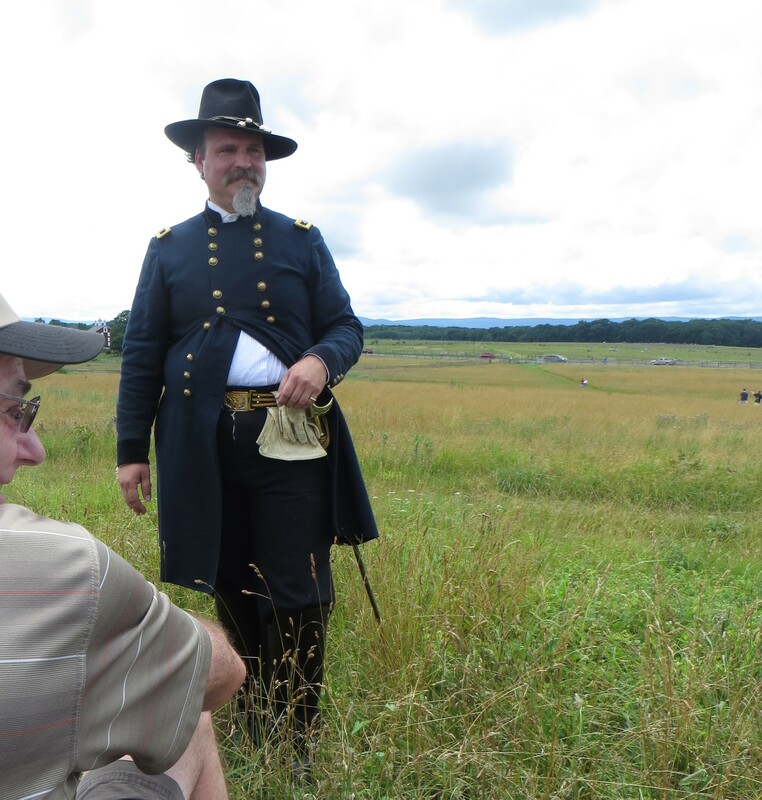 Gallery | This entry was posted in Pennsylvania and tagged 150th anniversary, Gettysburg, Pickett's Charge. Bookmark the permalink. What a neat opportunity! Thanks for sharing! The Crazy Lady made me chuckle – there’s always one of those, isn’t there? What an amazing experience – getting places early certainly pays off. But must also have been a very long and exhausting day. Not sure I would have had the stamina for a three hour wait in the sun for anything. Not without a book, a bottle of water and nearby bathroom. The lady sitting next to me had a book. I didn’t think of that. There were port-a-potties nearby, but I didn’t want to leave and lose my space. Lucky that I needed need to — a direct result of my not carrying water with me. I did get a tad sun burnt. I had a hat but didn’t wear it.